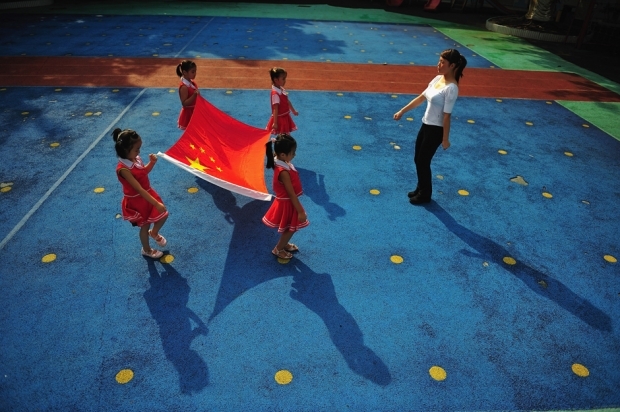 A teacher leads students during a training session of the “Little National Flag Squad” at the Jijian Kindergarten in Shenzhen, Guangdong Province. This story by Liz Carter was originally published by Tea Leaf Nation. In the southern Chinese province of Guangdong, carriers of the AIDS virus are now allowed to teach schoolchildren. The recently-announced change in regulations marks a step forward for AIDS activists, with the hashtag #AIDSPatientsCanBeTeachers# now trending on Sina Weibo, one of China’s most widely used social media platforms. It was all the result of a legal tweak, one quickly heard throughout China. The “Guangdong Province Standards for Health Inspections for Those Applying for Educator Qualifications” were revised to eliminate the clause “AIDS carriers are not qualified.” In the online dialogue about the changes, some netizens voiced their worries that this would expose children to danger, while others commended the government’s progressive reforms. Wrote one Weibo user, “This is revolutionary progress in China on the issue of AIDS. Some people ask whether the students will get AIDS. Have a little common sense, OK? There are three ways in which AIDS can be transmitted; you must think that all people are like that one primary school principal.” Another wrote, “Alright, as long as you don’t let them be school principals! !” Both commenters were among the many that referenced a recent incident in which a primary school principal kidnapped six young girls and took them to a hotel room, where they were allegedly sexually abused. Provincial authorities had sought input on the regulations last year, and reportedly removed the clause banning people living with AIDS from the teaching profession after an unnamed nonprofit had advised them to do so. One employee of the nonprofit, surnamed Guo, reported receiving threatening phone calls from a teacher after the revision was announced. The spread of HIV/AIDS in China has a unique history, in that many first contracted the disease through contaminated blood from substandard plasma collection equipment in Henan province. A subsequent cover-up of that information led to many other infections. Many of those infected due to the blood-selling operations and the cover-up— an estimated 100,000— are now active in protesting for higher standards of care. There have been setbacks, including the silencing of AIDS activists and organizations, and no top officials have been punished for the cover-up. Yet AIDS activism in China is strong, with groups at the local and national level lobbying for increased awareness and better care. Despite authorities’ past failings, and mixed reactions from the public to the news, the revisions still stand to take effect in September of this year, marking a step forward for educators living with AIDS.